Thousands of years ago there was a demon king called Hiranyakashyap. He was the brother of Hiranyaksha. He was also a devotee of Lord Brahma. His years of meditation and prayer impressed Lord Brahma. He tells Hiranyakashyap that he would grant him one wish (whatever the wish may be). Hiranyakashyap wanted to be immortal but he knew that Lord Brahma cannot grant immortality to anyone. So he asked something close to it - Hiranyakashyap asked that his death not be caused by man or beast, with a weapon or without a weapon, during the day or the night, indoors or outdoors, on earth or in the sky. Since Lord Brahma had already promised him, he had no alternative but to grant the wish. Once he got the wish Hiranyakashyap became very proud. He believed that he was invincible. He started expanding his empire. And very soon he was ruling the whole earth. He was a very cruel king. He was extremely egotistic and believed that he was the creator of all. He ordered all his people to worship only him. He believed that he was the God and there was no one above him. Hiranyakashyap had a son called Prahalad. Whilst the whole kingdom was worshiping Hiranyakashyap, his own son, Prahalad, refused to worship him. Prahalad was a devotee of Lord Vishnu. He truly believed in Lord Vishnu. Hiranyakashyap was extremely upset with his son. He tried to convince his son that he was wrong and that he should worship only his father. Hiranyakashyap failed to make his son believe that he and only he was the God. You can read my blog post about Holi and how Hiranyakashyap tried to kill his son. Meanwhile all the Devas and Lord Brahma approach Lord Vishnu for help. Lord Vishnu agrees to help them. He is quite annoyed and angry at Hiranyakashyap for the way he has been treating his son. Lord Vishnu incarnates Himself as Nara-Simha (half man half lion). He does this because Hiranyakashyap can’t be killed by a man or a beast or by God. At Hiranyakashyap’s palace Hiranyakashyap and Prahalad were having an argument. Prahalad says that God is everywhere. To that Hiranyakashyap disagrees and says he can’t be present everywhere -In a very sarcastic tone he questions if God could be found in the pillar he was standing next to (the pillar happened to be on the threshold of a courtyard - neither indoors or outdoors). Without hesitation Prahalad says ‘yes’. In a fit of anger, Hiranyakashyap breaks the pillar in an attempt to prove his son wrong. But to his surprise, Lord Narasimha, leaps onto him (from inside the broken pillar). A fierce battle emerges between Hiranyakashyap and Lord Narasimha. Eventually Lord Narasimha puts him on his thighs (neither on earth or sky), uses his sharp nails (no weapons) and kills him. This happens in twilight (neither day or night). 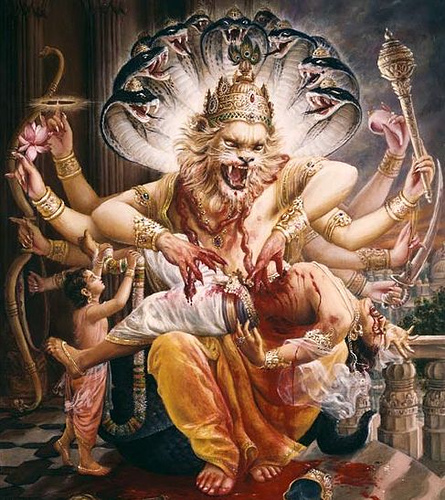 After all Lord Narasimha met death ,,,how Sarabha Upanishad ( Occuring in the Atharva-Veda)....says it all,Sharabha Mooti tore Lord Narasimha to death where as the gandabeyrunda or what ever is not stated in any scriptures ,as it is an story created by Vaisnavas. Any twice born who reads this, which is called “the great Sastra of Paippalada” or makes others read it, would get rid of births and deaths and attain salvation. The Upanishad tells that he will become similar to Brahma. Here ends the Sarabhopanishad, as contained in the Atharva-Veda.